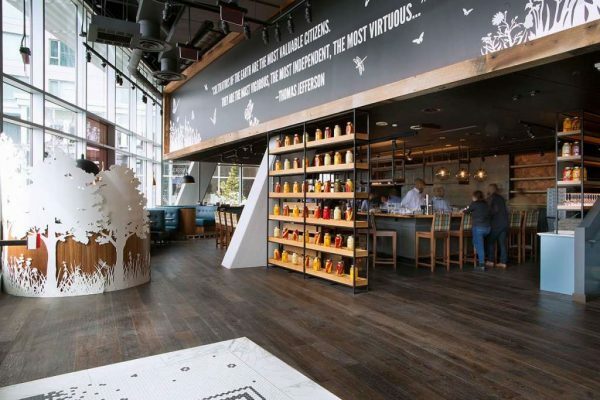 Founding Farmers, a 13,000-square-foot restaurant, is now open at 1904 Reston Metro Plaza. The restaurant by Farmers Restaurant Group is open seven days a week for breakfast, lunch, dinner and brunch. Founding Farmers also offers on-the-go breakfast for customers at the “First Bake Cafe.” Reservations are available online. Validated parking is available in the Wiehle-Reston East parking garage, as well as valet parking for customers who pull up their vehicles to the plaza. Founding Farmers Reston will have many guest favorites, such as house-made pastas and our Southern Fried Chicken & Donut. Our chefs are also particularly excited to share a nice range of cuts from our Steak House, such as our classic 48-Hour Salt-Cured Prime Rib. Some of us can’t wait for the comforting and wholesome grain and protein bowls, or the decadence of our homemade desserts and hand-churned ice cream. Of course, we will be serving our large selection of craft cocktails made with spirits from our own distillery in DC, Founding Spirits. The restaurant has been is built with the same sustainably-minded practices we use across Farmers Restaurant Group, pursuing LEED and Green Restaurant Association certifications. We also have amazing artwork from a great group of original artists to share with our guests and to help tell our story. Sweet Leaf, a cafe adjacent to the new restaurant, also recently opened at Reston Station Plaza.